In this article we are going to explain the various payment features in VIENNA Advantage POS system. > How to manage bar codes with VA POS in Apparel and Fashion Retail? A standard POS solution should provide several payment options. But a great POS solution will allow you to customize these options. 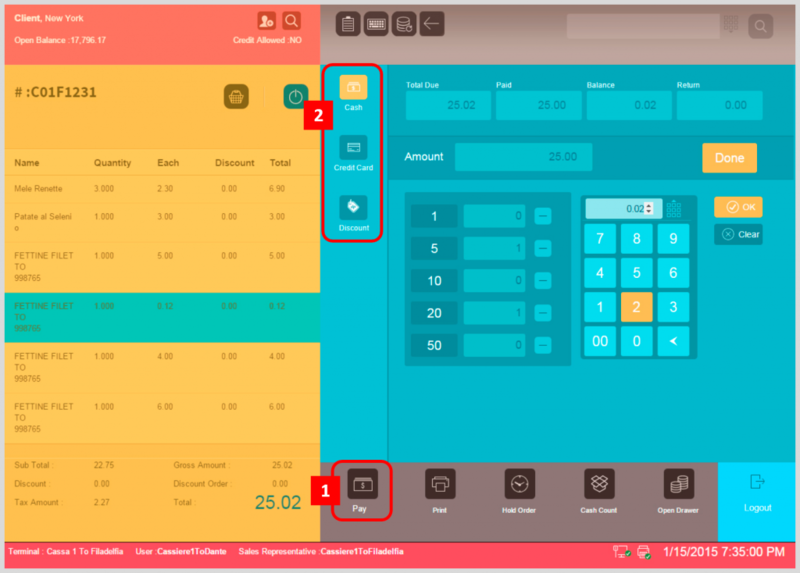 Customization of payment options is a standard feature in VIENNA Advantage POS Solution, and now we are going to explain how it works. Once the scanning of the products is done and order is closed, you can click on the “Pay button”  to proceed with the payment. A new window opens from where you can choose from a list of payment options. In the example below  we have shown three standard options to choose from: Cash, Credit Card, and Discount. The payment fields are dynamic, and VIENNA Advantage POS allows you to customize them and their content according to your business needs. For example, you can add new fields such as Gift Vouchers, Reward Points, etc. You can customize the content and the buttons of each field, or you can add or remove fields. Split payment is another payment feature that VIENNA Advantage POS provides. So, how does it work? A customer may choose to pay the order using two methods: cash and credit card. No problem at all! Just insert the amount they want to pay in cash, then put the credit card in the card reader and insert the amount they want to pay with credit card. Click done, and that’s it! A new window will pop-up with the return amount (if applicable). After you close this window, you may print your receipt, and go to next order. When your shift ends, and you are handing over the cash counter to the next cashier, the “Cash Count button”  is another payment feature available to use in VIENNA Advantage POS. Manually count the cash in your counter, enter the amount in the POS and then the system will automatically tell you how much cash it should really be. If there is a difference it will show you on the screen. Furthermore the counting can be denominated, by clicking on the “Denomination button” . Another feature available in this menu is to transfer the whole cash into another cash book, which will be the main cash book of the shop. To do that, click on the “Transfer button” . Imagine a situation when the cashier has scanned 50 items, and then the customer realizes that he has forgotten his wallet in the car. The Hold Oder payment feature allows you to hold the order in the back, till the customer returns with the cash.By clicking on the “Hold Order button” , a new window opens (see picture below). Click on the “Hold Current button”  to hold the current order and continue with a new one. If the customer comes back later, just click on the “Hold Order button” again, and choose the order you want to un-hold, from the list. By clicking on the “+ button” , you will un-hold the order and it will automatically show in the Order section of the POS. A customer may want to return a part or the whole order. This payment feature is also included in the standard VIENNA Advantage POS solution. Let us explain the return process. Go to the order section and click on the “Order Type Button”. From the new window select “Return Order”. See picture below. After clicking the button, a new window pops up on the screen. Use it to type the Invoice No. manually, or scan the receipt bar code to automatically enter the order. Than select the items that the customer wants to return and click “OK”. That’s it!